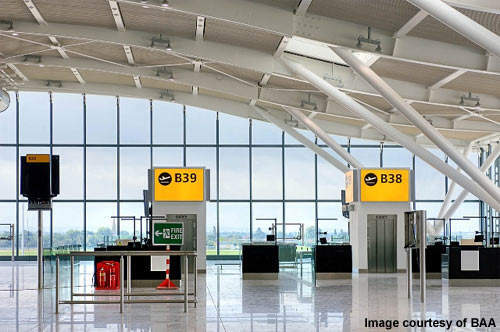 The British Airports Authority (BAA) is responsible for the UK’s main airports including Heathrow, Gatwick, Stansted, Southampton, Glasgow, Edinburgh and Aberdeen. 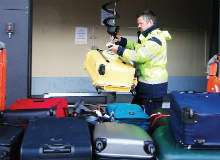 As a private company, it is relatively unusual among European airport owners and has to raise funding from its shareholders. Heathrow Airport is well known as being one of the busiest in Europe and has to handle over 60 million passengers each year. 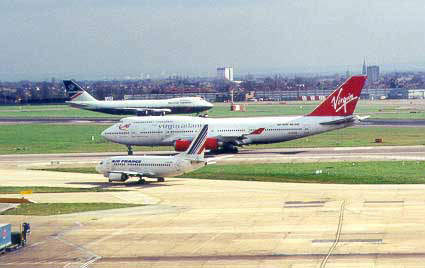 When the new Terminal 5 comes into operation (2008) the passengers per year will begin to approach 90 million. 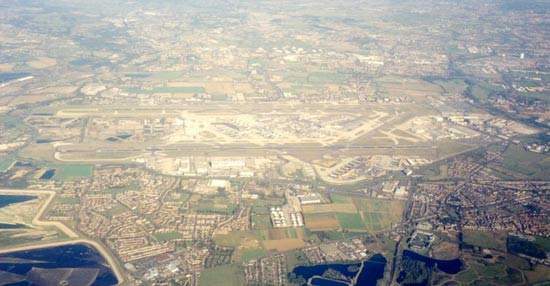 The provision of the best ATC control system is essential for the smooth running of this important airport. Prior to July 2001, National Air Traffic Services (NATS) was a wholly publicly-owned corporation. Today, under a highly controversial Public Private Partnership deal, it is jointly owned by the UK Government (49%), a consortium of airlines (The Airline Group, a consortium of seven carriers led by British Airways and Virgin Atlantic) and its staff (5%). The new ATC Tower at Heathrow is a new prominent feature at the airport. The tower was designed by the Richard Rogers Partnership and engineered by Arup. The tower reached an important stage at the end of 2005 with a topping-out ceremony when its full height of 87m (285ft) was achieved. The topping-out ceremony involved gold bolts being tightened ceremoniously at the base of the tower to mark the completion of the main structure. The new tower is more than twice the height of the old tower and will offer better unobstructed 360° views of the airport for controllers. 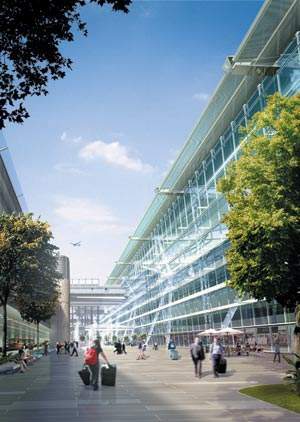 The 55 Heathrow air traffic controllers are expect to move into the £50 million tower in the last quarter of 2006/07. 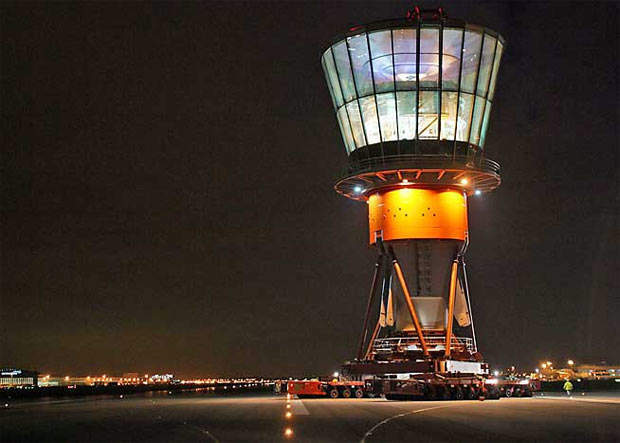 The cab section of the tower was prefabricated at a nearby site close to the airport’s southern boundary before being moved across to its final location in the central terminal area, near to Terminal 3. Starting in January 2005, prefabricated 12m sections were then inserted under the cab forming a steel mast and gradually building to the full height of 87m. The tower is supported by a 15ft (4.6m) diameter steel mast and three pairs of cable stays anchored to the ground. The mast, which is encircled by a three-storey technical and administrative building, provides access to the visual control room via one internal and one external lift, plus an enclosed stairway. The tubular plated main core was shaped to accommodate lifts, stairs, services and electronics, and the three stays ensure the rigidity criteria for the radar systems. Because the tower was located in the centre of Heathrow, its construction was engineered so as not to interfere with the day-to-day running of the airport. This constraint required the 900t five-storey control room or cab section – which is 27m tall – to be moved almost 2km across the airfield to its final location. 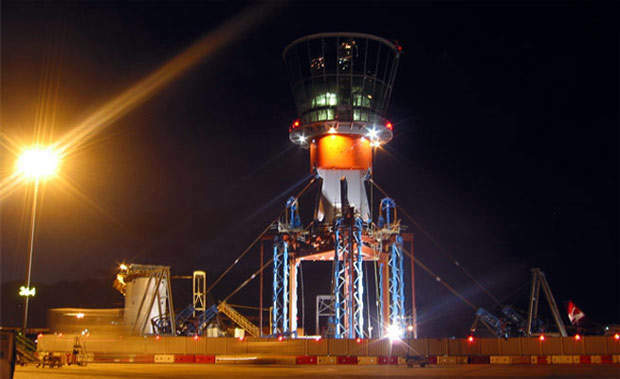 The operation of moving the cone-shaped top section of the control tower into place was carried out in October 2004. The unique structure was carried slowly on three remote-controlled hydraulic 144-wheel flatbeds along taxiways and across the southern runway by a specialised team in an operation that took just under two hours. The 144-wheel flatbeds were able to provided sufficient spread of the huge load with no damage to the airfield. The positions of the top of the tower and the lifting beams had to be accurately monitored as it was raised. Mason provided an automated system using GPS, high precision extensometers and laser technology to generate the position data, which was collected and controlled by Leica Geosystems GeoMos software. The structure was then slowly raised by the use of strand jacks until the first steel section of the tower could be inserted underneath it. The steel column, consisting of six sections and the tower were progressively raised one section at a time over several nights, while no planes were flying. For the tower construction Rogers were the architects and Arup were engineers for the permanent works. Watson Steel Structures Ltd and AK Heavy Engineering were responsible for the fabrication machining and erection of the permanent works. 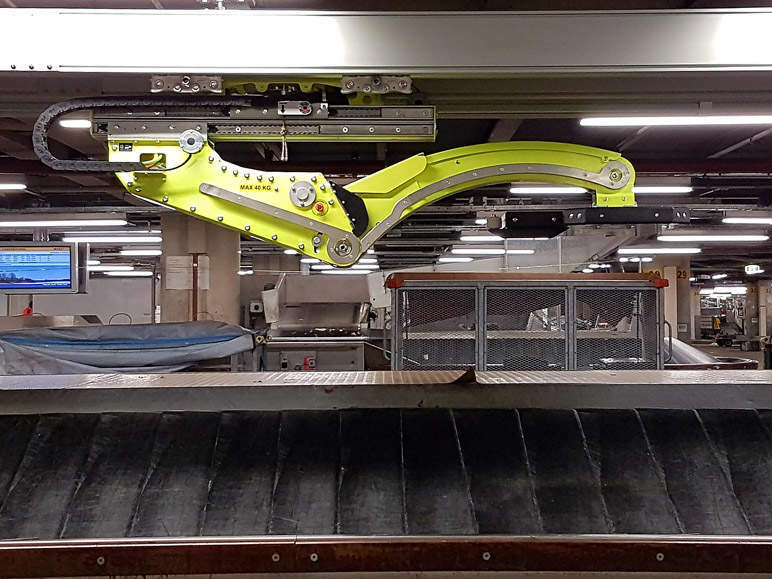 Rolton Group were responsible for the temporary works design, Fagioli PSC provided their expertise in strandjacking, Dorman Long Technology provided the liftmaster and the auxiliary hydraulic jacking systems, Mace Ltd worked as principal contractor and Management contractor. Laing O’Rourke had responsibility for the substructure and Tony Gee & Partners provided the third-party checks on the temporary works design. Mason Land Surveys provided dimensional control services to both the cab construction site, and checks on the mast sections being machined in Sheffield. 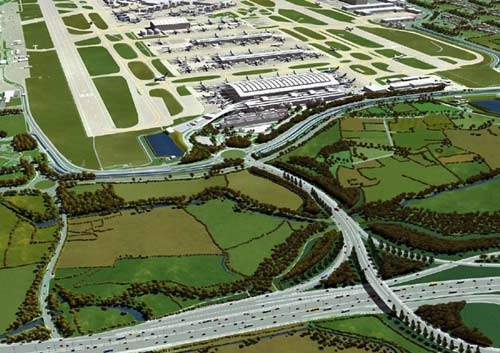 The UK National Air Traffic Services (NATS) has installed a BEST ATC Tower Simulator from Micro Nav for London Heathrow Airport. The system will simulate all the many changes planned for the airpport and will be used for familiarisation, evaluation and training. A 360° 3D panoramic display will show a realistic view from both the existing and the new towers. The cylindrical screen is 10m in diameter and will combine ten powerful projectors with edge matching and blending to give a continuous field of view. It encloses a representative simulation of the new tower cab positions, equipment and layout. The latest visualisation technology has been incorporated. Evans & Sutherland have supplied their EP-10 image generators and 3D modelling of the airport, aircraft and ground vehicles. BARCO have supplied their SIM6 projectors, the screen and display infrastructure. The simulator will replicate day time, night time, dusk and dawn conditions with seasonal and inclement weather conditions including fog, mist, rain and wind. All the effects and operating challenges are run by the fully customisable BEST host system and are selected and controlled by the instructors. Micro Nav are the prime contractors and will supply the BEST ATC tower and radar simulator with tower working positions; pseudo-pilot positions, data preparation and support workstations. 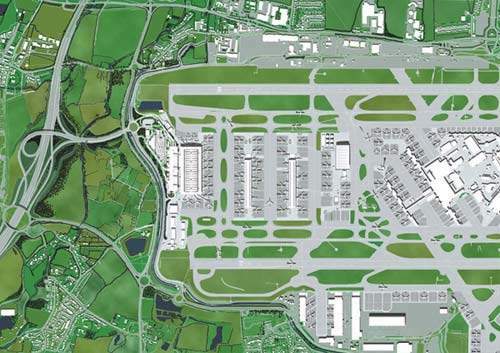 BEST can simulate the existing and the new Heathrow Airport layouts plus any further changes to be evaluated. 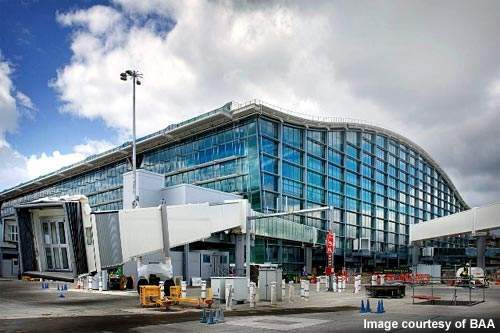 When the new, 87m-high control tower at London Heathrow becomes operational it will be equipped with Terma’s information support system, ATC*ISS Tower. The ATC*ISS system will replace the existing system supplied by Raytheon in 1999–2000 in the old tower. The change-over will hopefully be smooth as the new ATC*ISS uses the same convenient HMI (Human Machine Interface) as the familiar system, and will therefore require only a minimum amount of training before implementation. One of the best features of ATC*ISS is the high ratio of COTS (Commercial Off The Shelf) components since this means a high up-time, a low failure rate, modest maintenance costs, and overall systems reliability and safety. Firstco was founded in 1998 and has grown rapidly to become a force in the areas of technical consultancy, technical assurance, project management and systems design and integration. Firstco is now the UK's leading independent controls and communications systems specialist, with the company's expertise continually transforming the built environment into efficient and effective operational facilities.